This blog is no longer being actively updated. Our daughter returned to public school in October 2013, and is doing very well. She adjusted to the change beautifully and we all feel like it was definitely the right thing to do. I am still more than happy to answer questions about homeschooling, or talk about our experiences with leaving and then returning to the public school system. Feel free to email me at kelli@monadnockmama.com. How do you know when a good thing has run its course? You may have noticed that I haven’t posted here in awhile. There’s a reason for that. It’s because we haven’t done anything worth posting about. Well, not in an academic sense, anyway. We’ve played a lot of Minecraft, learned how to make animated gifs with photoshop, done a lot of drawing, read some books, and watched a few too many Disney shows on Netflix. But, we haven’t learned any math, or history, or science, or…well, you get the picture. And, so, having disclosed that, I will also disclose that we are sending Lillia back to public school. Yes, in the middle of October. 1) I will never be comfortable with “unschooling,” and for the past six weeks I have found it nearly impossible to engage Lillia in any meaningful way. She’s bored. I’m frustrated. Let me be clear — it’s not burnout. I was really excited about this school year, but I discovered a couple of weeks into it that Lillia was just not interested in what I had to offer. It was a daily struggle to get her to do even the most basic stuff. And, since I’ll never be okay with her playing Minecraft all day while her peers learn multiplication, division, and the five paragraph essay, I (that should say we) feel that this is the best decision we can make for Lillia right now. 2) We always knew she would go back to school eventually, and I guess “eventually” arrived a little sooner than we expected. She is ready, and looking forward to being with her friends again. We had the chance to meet with the principal and both of the fourth grade teachers yesterday. We discussed Lillia’s strengths and weaknesses, how to challenge her and how to nurture her (which are one and the same thing according to a smart lady I know). I do feel sad, and I would be lying if I said I wasn’t going to feel a sense of loss about what could have been. I love the idea of homeschooling. I love poring over curriculum materials, making booklists, and thinking up cool field trips to take. But, the reality of homeschooling is very different than what I imagined it would be. There seems to be a pervasive idea on the interwebs that if you are having a miserable time homeschooling, you are doing something wrong. You, the parent, are a failure. Well, let me just counter that by saying that homeschooling is really, really hard. There’s not a lot of reward for the amount of frustration involved. Some people seem to have it all together, but I would guess that a) it’s not as easy as they make it look, and b) they’re in the minority. 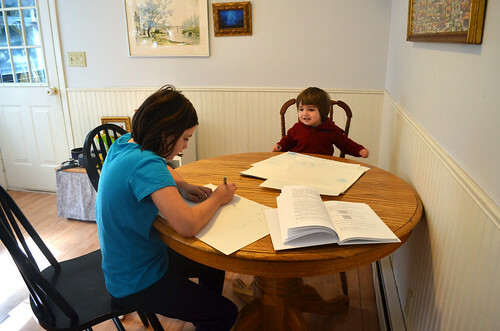 It seems to me, anecdotally speaking, that there are probably particular combinations of parent-child temperaments and interests that make homeschooling easier for some and harder for others. Do I still have major qualms with our public education system? Absolutely. Do I still think teaching to the test is total garbage? Yep. Am I just choosing the lesser of two evils? I believe in the concept of “good enough.” Right now, homeschooling isn’t good enough for my standards. We’ll see what the school has to offer. I plan to keep this site up for the time being. I like that we have a record of our year, and the time we spent together (see, I do feel sentimental about the whole thing). If we do things education-related I will certainly write about them here. Your comments are always welcome. If you are thinking about homeschooling (or not homeschooling) and need advice or moral support in either direction, I’m happy to chat. Just shoot me an email kelli@monadnockmama.com. This was a bit of a light week, work-wise, because I had a terrible cold for most of it. A lot of the work we do involves my reading out loud and I just didn’t have the energy (or the voice) for doing much of that. Still, we did get some work done. We are continuing our work on Ancient Greece. This week Lillia read Wise Guy: The Life and Philosophy of Socrates, written by M.D. Usher and illustrated by William Bramhall. One of the great features about this book is that there is a narrative aspect which provides an overview of Socrates’s life, but also on each two-page spread there is an info box with more detailed information about his life and philosophy. I’m not sure how Lillia read it, but I thought it was nice that there was an option to read just the story, or just the boxes, or both, in whatever order one chooses. The illustrations are also nicely done — Socrates is not often depicted as a child, but I think the illustrator did a great job of portraying him in his youth. 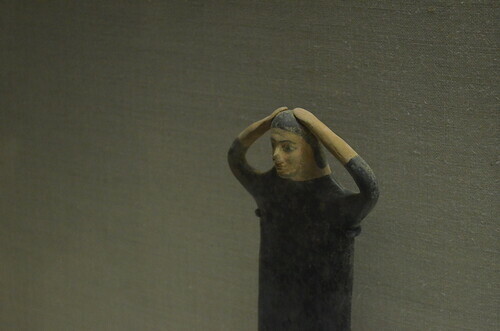 We’re also still reading Black Ships Before Troy and just finished up the part of the story where Patroclus is killed. 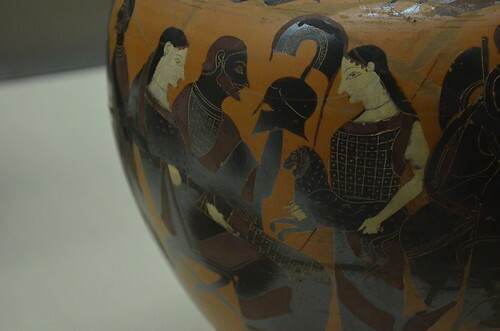 If you’ve read The Iliad then you know what happens next! (Hint: things don’t look good for Hector…) Next week, when my voice has returned, we will start reading about Archimedes as a nice way to tie the history of Science in to our Humanities unit on Ancient Greece. Because I was not feeling that great, Lillia picked up a lot of the slack this week. She did some great independent work in math, but she did get pretty frustrated when confronted with multiplying two-digit numbers with one-digit numbers (ex: 24 x 3). At one point she ran out of the house in tears, but then I looked out the window and saw her trying to solve the problem with chalk on the driveway. When I thought she was calm enough, I joined her and tried to explain the process. I think she got it, for the most part, and practice will help. I have noticed this year that Lillia really wants to be alone when working through a hard problem. She doesn’t want help, necessarily, unless she asks for it. I know it’s because she doesn’t want me to see her get the wrong answer. I am thinking about how to use this aspect of her learning style in a positive way. Suggestions? I’m feeling a lot better now, so hopefully it will be full steam ahead next week. This week Zane was very involved in an interesting construction project. 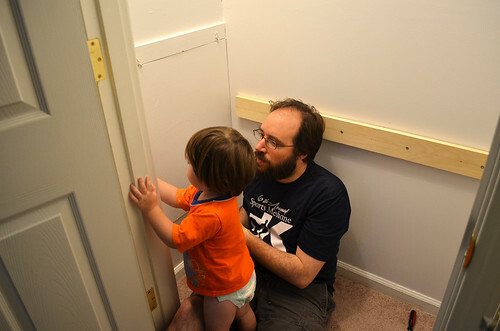 My husband, Damian, has been working hard this past week to build me a desktop for my “office” in our bedroom closet. 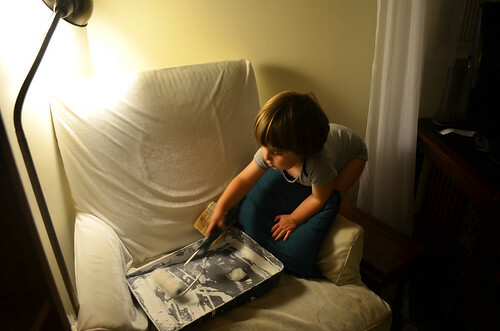 Zane was really enamored of the whole process, especially the parts that involved power tools! And, of course, once the boards were installed there was painting to do! Here he is “practicing” with some of the supplies. Also, I am pleased to say that Zane can now correctly identify red, orange, green, blue, purple, and brown, at least most of the time. Color blindness runs in my family, on my mom’s side, so there is a small chance that Zane is red-green deficient. Neither one of my brothers inherited the condition, so it’s possible that my mom and I are not carriers, but we have never had that confirmed. He has no trouble at all identifying red, but sometimes confuses purple and green. I don’t know if that’s because those colors look the same to him, or just because he hasn’t quite mastered them, in terms of labeling. He’s too young to take a color vision test, so we’ll just have to wait and see (no pun intended – ha!). I’ve been wrestling quite a bit this week with the subject of women in philosophy. I ordered the Young Person’s Guide to Philosophy for Lillia and was thumbing through it when I noticed that there were only TWO women philosophers mentioned in the whole history of the discipline, dating back more than 2,000 years (Hypatia & Simone de Beauvoir). Was it possible that this was just an overly sexist book? I looked at the information about the assorted editors and consultants who helped to make the book…overwhelmingly female. And, to give the book’s author credit, he tried really hard to include women whenever possible (mentioning the contributions of wives and mothers seems to be a popular technique). But, it turns out that philosophy has been, and STILL IS, so male-dominated that these two women accurately represent women’s recognized (key word) achievements in the discipline of philosophy. Boy, does that make my blood boil. The old cliche that “women can’t think” is alive and well, folks. And, I’m not the only one who has noticed. If you’re interested in reading more, click on the links below. Now I’m on a quest to find a way to teach the history of philosophy to Lillia without bringing attention to the fact that 1/2 the population of the world has been virtually excluded from it…and still is. Can you believe it’s already the beginning of another school year? The summer went by too fast. It always does. 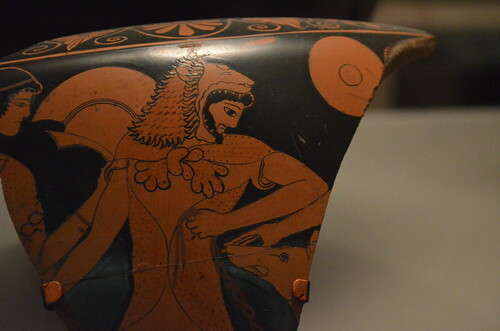 This week we picked up right where we left off last spring with the Ancient Greeks. We’re continuing in Roy Burrell’s Oxford First Ancient History with the Persian Wars. We learned about Darius I and his defeat at Marathon. Lillia felt quite sorry for Pheidippides for having to run so far and then to fight in a war directly afterwards! 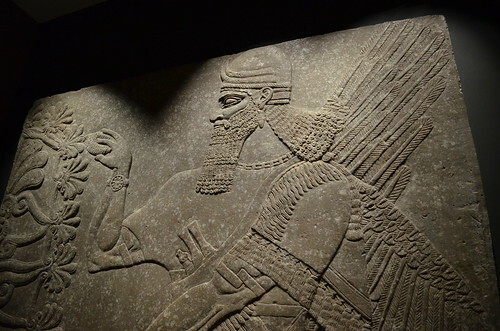 We also learned about the battles between Greece and the Persian Empire (at this time ruled by Darius’s son, Xerxes). We learned about how the Greeks suffered defeat at Thermophylae, but were able to outwit the Persians at Salamis by ensnaring them in a narrow passage of water between mainland Greece and the island of Salamis. The Greeks had an advantage in naval warfare as their ships were superior to those of the Persians. We are continuing to use the note-taking method that we developed at the end of last year using templates from Tanglewood Education in conjunction with images that I prepare and print out ahead of time (the templates are available as a download and cost on $2.50 — probably one of the best investments I’ve made since we started homeschooling). This method seems to work well for Lillia because I do the work of pulling out key pieces of information and she is still responsible for filling in the details. We’re also reading Black Ships Before Troy, by Rosemary Sutcliff, an adaptation of The Iliad that is beautifully (I mean really beautifully) illustrated by Alan Lee. I’m a huge sucker for beautiful illustrations, which is what drew me to the book in the first place, but Sutcliff’s prose is equally amazing. I love that she was able to preserve the Homeric-style naturalistic analogies (the movements of soldiers are often compared to water, or birds, or other natural phenomena), while at the same time constructing a plot line that younger readers can follow and that doesn’t dwell so much on the gruesomeness of combat as the original. I highly, highly recommend this book, and you absolutely must get the illustrated hardcover or you’re missing half the beauty. In math we are starting Life of Fred: Goldfish over again because we were only a few chapters in and I thought it would be good to refresh our memories. Additionally, this is the first book in the series that deals with multiplication and I want to make sure that we are thorough. Here she is diligently answering her “row of practice” problems. One of my goals for this year was to help Lillia learn to write on command without freezing up. I thought that a good way to do this would be to use a writing journal with pre-made pages that had prompts on them — nothing too personal, just short little assignments. I found a really nice set of back-to-school themed prompts on Teachers Pay Teachers and we’re giving them a try. So far, she’s done them without complaint, so I’m really thankful for that! The author of the prompts has a package with a whole year’s worth of prompts. If these keep working well for us, I might buy it. The calendars are pretty cute. That’s about it for this week. Next week we’ll be starting science, handwriting, and poetry/music/art appreciation. We’re easing into the new school year. Over the summer Zane experienced a huge cognitive shift: his language skills accelerated at an unparalleled rate; he can now sit through several picture books without getting antsy; he can identify red and blue consistently, and often green; and just this morning I discovered that he can count to 4 (if prompted with 5, he can count all the way to 8)! He just turned two at the end of August, so I think he is doing really well. Here he is enjoying a little mid-morning snack with Richard Scarry’s Cars and Trucks and Things That Go. I would really like to get him involved in something that gives him access to his peers. The only people he sees are grown-ups and tweens! I am considering story time at our local library, or maybe a dance or tumbling class. He’s very physical, and his gross motor skills are right on track if not ahead of schedule so I think he would enjoy doing something movement-based. I’m feeling pretty good about this coming year. With a whole year under my belt, I no longer feel like a newbie struggling to make heads or tails of this whole homeschooling thing. 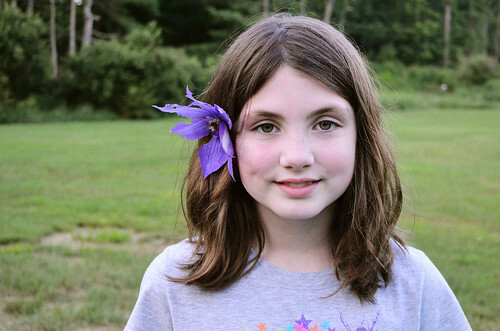 Despite my confidence, I am still hesitant to tell people (especially strangers) that we homeschool our daughter. It’s amazing to me how judgmental people are when they encounter something that’s even just slightly outside of the “norm.” I’m not saying they’re not entitled to their opinion and, given the ubiquity of public education and the sort of religious zeal that people have for it, I’m not that surprised that they think we’re weird and/or damaging our child. But, I know that we are actually doing something great for her and that we are all lucky to have this opportunity for as long as it lasts. When we say that “education is an atmosphere,” we do not mean that a child should be isolated in what may be called a ‘child-environment’ especially adapted and prepared, but that we should take into account the educational value of his natural home atmosphere, both as regards persons and things, and should let him live freely among his proper conditions. With that quote in mind, and the beginning of a new school year fast approaching, I thought it might be fun to show you our home learning environment. Our homeschool “classroom” is actually our kitchen (and often our living room, too). 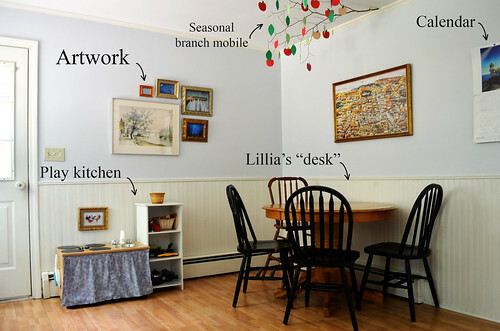 This setup works great for us because Lillia can do schoolwork at the table while Zane can engage in pretend play with his “kitchen,” or play with playdough, or eat a snack, or do some painting…it’s nice to have everything all in one place. 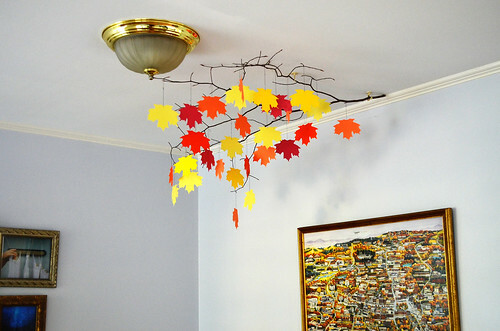 We made the tree branch mobile last year and we change it with the seasons. 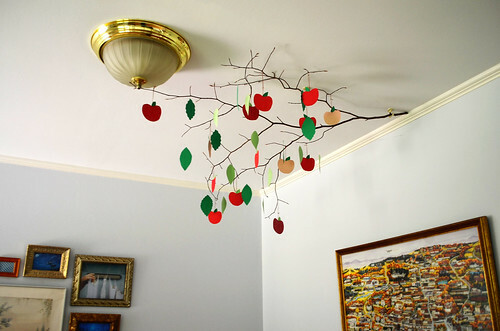 Right now we have apples hanging from our “tree” but soon we will have brilliant fall leaves — it brings nature indoors for the kids, and gives us lots of opportunities for seasonal crafts. Zane loves to help make the paper decorations and often comments on them for several days after they are changed. 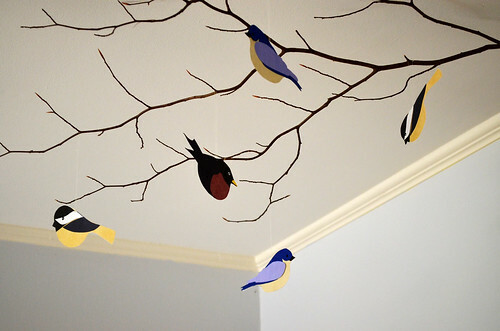 Here is the same branch mobile at the beginning of April — no leaves yet, but lots of early spring birds. So, there you have it! The humble “classroom” where much of this coming year’s growth and learning will take place. 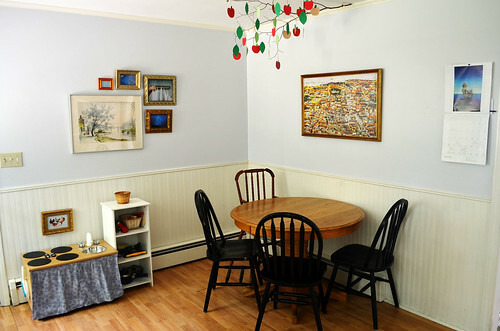 Do you have a special room designated for homeschooling, or do your rooms serve multiple purposes (like ours)? 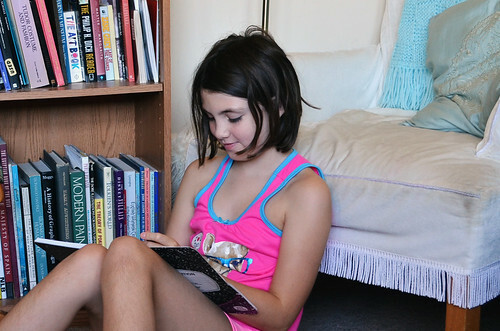 I’m always interested in seeing the “where” of other family’s homeschooling experiences. The kids in our district went back to school today. But, not us! Oh, no, we are waiting until after Labor Day. That’s what we did last year and since that worked out well for us we’re doing it again. Lillia will be going to art class at the school on Friday but the rest of the week belongs to her. A last hurrah, if you will. In the spirit of anticipation that this week brings I wanted to share some of my goals for the coming year, for both kids. — Learn the multiplication facts from 0-12. — Continue to practice and become proficient at writing in cursive. — Overcome fear of writing on command. — Develop some coping strategies for when difficult problems arise. 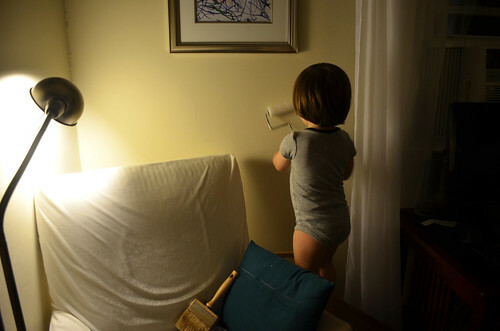 — Work on developing independence & a sense of personal responsibility. — Continue to develop vocabulary. — Learn to identify more colors (he can do red, blue, and green). — Read EVERY day; an adult reading to him, that is. — Find opportunities for peer socialization. I know these aren’t the loftiest goals but I am avoiding listing anything too specific here. Perhaps other goals will make themselves known as the year progresses, but I am trying not to have expectations that are too high at the outset. I learned a lot last year about what is and isn’t realistic, when it comes to academics as well as the homeschooling experience in general. I am certainly the type of person who likes to know what’s coming; the type of person who thrives on having it all worked out and written down beforehand. Well, last year taught me that most days aren’t going to look anything like they do on paper. Having a rough outline is great for staying on track (definitely important if there are certain things you really want to cover). But, trying to plan out the day by the hour is a waste of time. Some days there will be a cranky toddler who just won’t let you get anything done. Some days there will be an anxious tween who runs away at the sight of her math book. That is reality. We took this trip at the beginning of July, but my computer was out of commission for the past month so I am just now getting this blog updated. 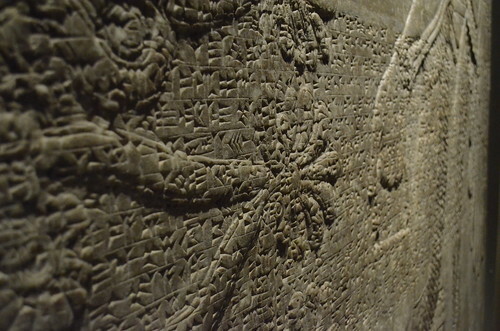 For our second big field trip of the year we visited the Museum of Fine Arts in Boston, Massachusetts. 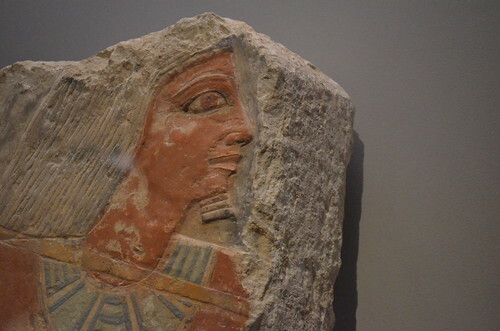 The MFA has an excellent collection of art from the ancient world which gave Lillia the opportunity to see artifacts from some of the cultures we studied this past year. 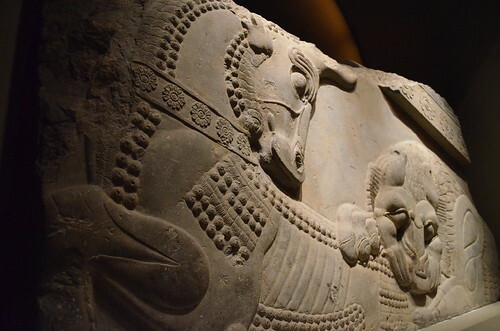 This exhibit gave us the opportunity to see some famous finds from the ancient near east. 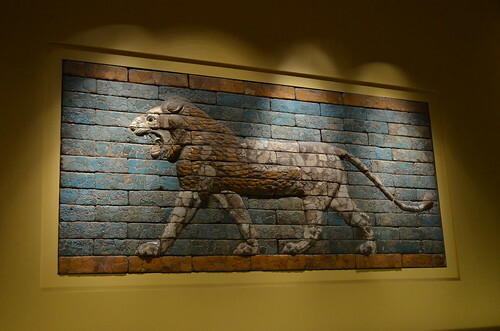 Lillia got to see a cuneiform tablet and a mosaic called the “Striding Lion” which dates to 604-561 BCE, among other things. 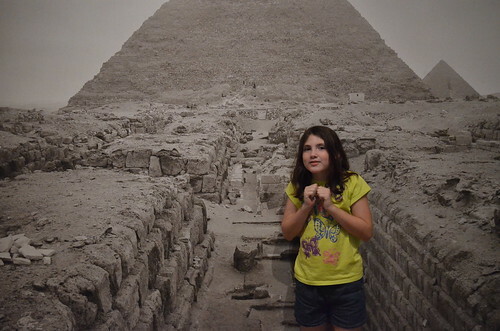 Lillia was really excited to see the Egyptian exhibit. 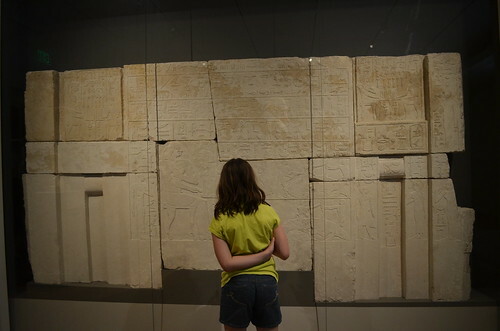 She has been fascinated with Ancient Egypt for some time and I feel like a lot of other kids her age are, too. There must be something about this culture that appeals to preteens. 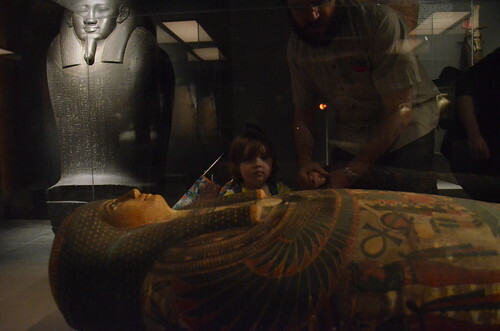 She was really enthusiastic about seeing the mummies, but when we got to them she said she was scared and asked to hold my hand (so sweet). 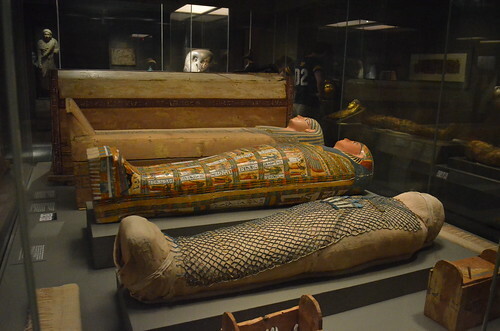 We briefly toured the Ancient Greece exhibit but by this time Lillia was collapsing from exhaustion (we had driven in the car all morning to get there so some people were full of energy and some were worn out, depending on their personalities). 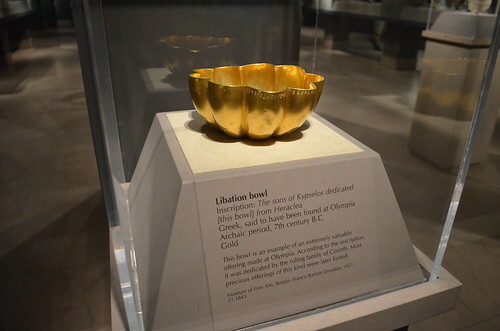 I was really exited to see the gold libation bowl (Oresteia, anyone?) 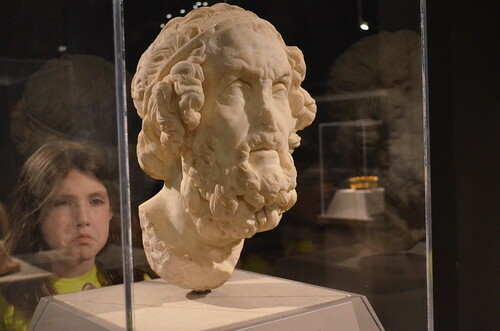 as well as the bust of Homer (which Lillia was less-than-thrilled about, as is attested by her expression in the photo I took of it). 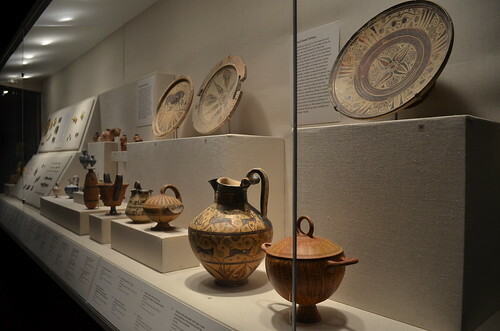 We still have some work to do on Ancient Greece so we might make a return visit in the fall, which we should probably do anyway so that we can also see their collection from Ancient Rome (our second unit of the coming year). I have a whole bunch of photos from our last field trip, and I really want to write a wrap-up post about our year. It’s been on my to-do list for the last…oh…six weeks or so. But, right now, I’m on vacation. I’ll be back sometime in August! Hope you are all having a great summer. Often when I read about homeschooling in other states I am reminded about how fortunate I am to live in NH, where homeschooling is very mildly regulated. While the state has virtually no control over what we teach or how we teach it, we are required to provide annual evidence of progress in one of two ways: a portfolio evaluation performed by a certified teacher; or standardized test results at 40th percentile or above. In the past, this evidence was submitted to the district for evaluation, and could then be used to determine the legitimacy of a home education program. As of last summer, this changed. While we’re still required to show evidence of progress, it no longer has to be submitted to anyone and it cannot be used to terminate a home education program. I keep a portfolio of Lillia’s work, but I am not too keen on presenting it to someone to be “evaluated.” It feels like a situation where I would have to “explain” the why and how of everything, and I’m just not interested in doing that. I’m also not a huge fan of standardized testing, for many reasons, but just once in the spring seems okay to me (and Lillia actually likes taking the test, for some reason). So, today was test day. Our district allowed us to take the test they use (the NWEA MAP Reading & Math). As usual, Lillia’s Reading scores were through the roof. Her overall Reading score was 232, which puts her in the 98th percentile for her grade, nationwide. I’m not going to mince words here — she is reading better (by quite a few points) than the average 11th grader. I’m actually a little overwhelmed by this knowledge, but not exactly surprised. On the other hand, her Math score was 203 which is, literally, the national average and puts her in the 50th percentile for her grade. Last year, her percentile was much higher. I’m still trying to sort through this but the most obvious explanation is that we just started learning multiplication, whereas her peers have been studying it all year. As I’ve mentioned many times we are using the Life of Fred books, and I love them. I am not blaming Fred for the drop in her math score. The Fred books are doing something completely different than what the district is doing (not coincidentally, the district is preparing students for the test that my daughter just took). I chose to go back to the beginning of the Fred series, even though the work was easier, because there are a lot of concepts that Stanley Schmidt introduces in the early books that Lillia will need to know later on. I didn’t want her to miss anything. But, because of that, we are just now getting to the books dealing with multiplication…so Lillia is behind. I’m trying not to agonize over this because I think that what we are doing has value, above and beyond preparation for standardized testing, but it will be helpful when I’m planning what to do next year. Math never came easy for me, and it’s possible it won’t be easy for Lillia, either. On the other hand, it will be interesting to see her scores at the end of next year when we have finished the Life of Fred elementary series. My guess is that there will be a big improvement. I. The parent shall maintain a portfolio of records and materials relative to the home education program. 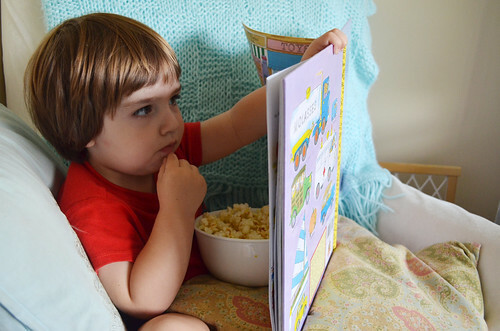 The portfolio shall consist of a log which designates by title the reading materials used, and also samples of writings, worksheets, workbooks, or creative materials used or developed by the child. Such portfolio shall be preserved by the parent for 2 years from the date of the ending of the instruction. 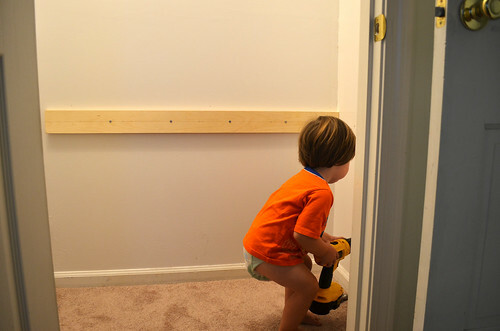 (d) The child shall be evaluated using any other valid measurement tool mutually agreed upon by the parent and the commissioner of education, resident district superintendent, or nonpublic school principal. (a) May be used to demonstrate the child’s academic proficiency in order to participate in public school programs, and co-curricular activities which are defined as school district-sponsored and directed athletics, fine arts, and academic activities. Home educated students shall be subject to the same participation policy and eligibility conditions as apply to public school students. (b) Shall not be used as a basis for termination of a home education program. 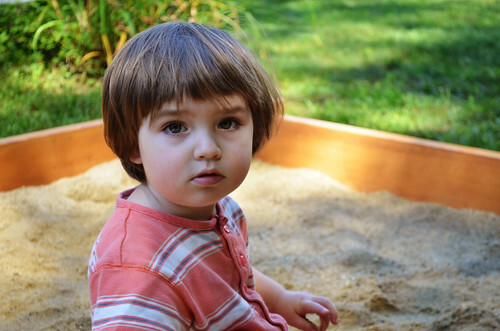 (c) Provides a basis for a constructive relationship between the parent and the evaluator, both working together in the best interest of the child. Source. 1990, 279:3. 2006, 13:4, eff. May 12, 2006. 2012, 227:2, eff. June 16, 2012. 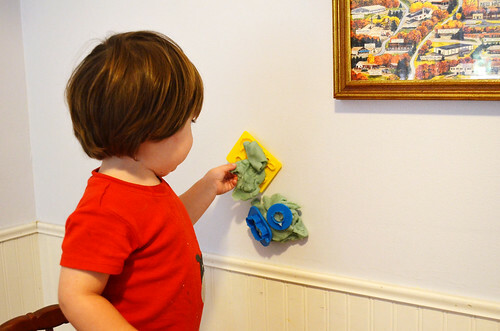 This is going to be a super short post because I have a ton of cleaning to do (toddler + bowl of corn chex = mess). If I have a chance, I might add some pictures at a later date, but it’s text only for now, folks! We’re cruising right along in our study of Ancient Greece. 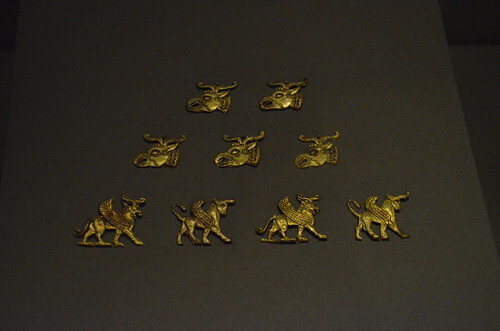 This week we learned about the Myceneans and the early Greek cities or ‘poleis.’ Did you know that the city of Mycenae had more gold than all other Greek cities combined? We also learned about the Dorian invasion. 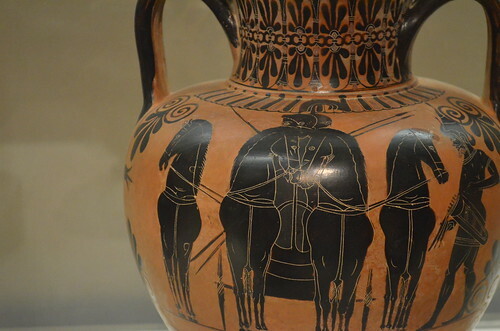 The theory goes that the Dorians were a people from the North part of Greece who invaded and conquered the Myceneans. Our textbook speculates that the Dorians were able to defeat the Achaeans (what the other Greeks called themselves) because of their superior iron weapons. 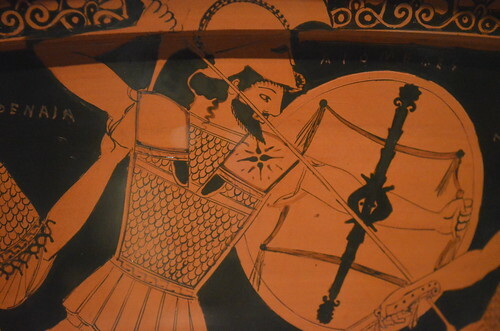 The Achaeans were still using bronze weapons, and iron is a stronger metal. 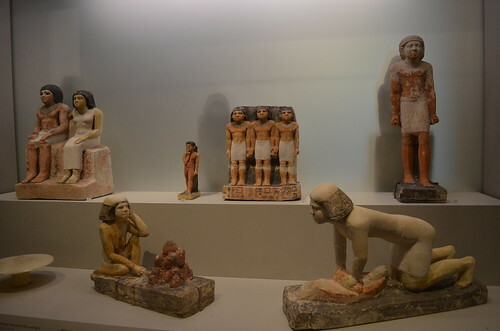 The only city that was not overtaken by the Dorians was Athens, though some Achaeans fled to the west coast of what is today Turkey and formed colonies there — these people were called the Aeolians and the Ionians. 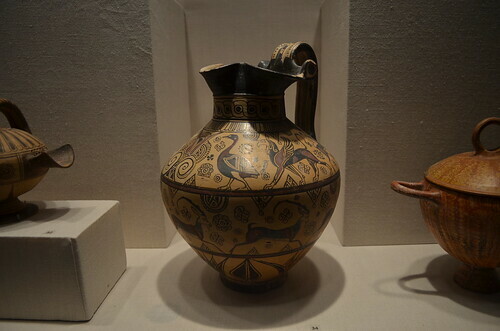 Whether or not it actually happened this way is still a matter of controversy, but it was proposed as an attempt to answer what happened to the Mycenean culture and language. This week we also started using these handy “Book of Centuries” templates from Tanglewood Education to record information from our Humanities lessons. I find it’s easiest to print out 3 or 4 pictures that have something to do with our lesson and then let Lillia write descriptions for them. 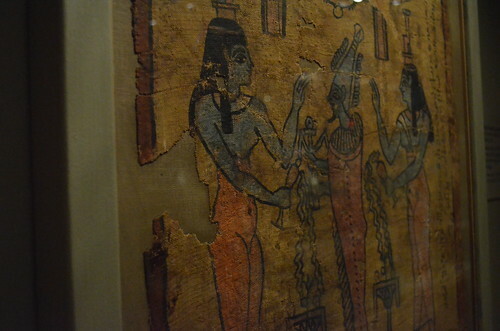 That way, she has to do some independent reflection but she’s not overwhelmed by trying to remember everything we read. We don’t adhere 100% to the Charlotte Mason method, but I do love many things about her educational philosophy. 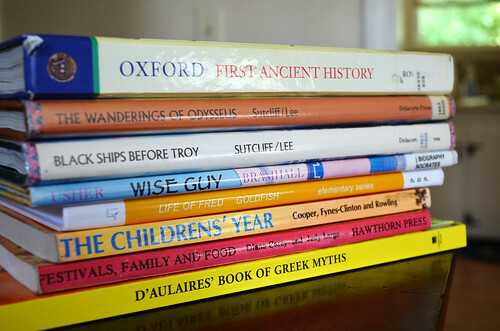 The “Book of Centuries” is a concept that many Charlotte Mason homeschoolers use, and I am quite fond of it. It’s so nice to have something to look back at when you come to the end of the year, and it satisfies my need to have tangible evidence of Lillia’s learning. We started out doing our own pages, but after the first unit we got quite lazy and stopped doing them entirely. However, these templates make it so easy and Lillia actually likes to do them, so I’m planning to have her do a couple of them for those units we skipped. In Math we are continuing to work on addition, subtraction, and multiplication. This week we reviewed the multiplication facts we learned last week, and we also learned how to multiply a two-digit number by a one-digit number (ex: 14×2). I am so impressed once again with the way that Stanley Schmidt chooses to teach more complicated math concepts right from the beginning. Instead of waiting until we’ve learned all of the multiplication facts, he introduces the concept of two-digit multiplication when we only know a few…but we know enough to do the problem, so we feel smart and successful! I know I say this every week but I LOVE LIFE OF FRED! Zane had a language explosion this week. He is using so many words now. I still have to act as translator sometimes but he is really working hard on his verbal communication skills. We’ve been taking walks with “Dada” (my husband) every day at lunch and Zane loves to see what’s going on in the world. He always points out interesting vehicles, other kids (there’s a child care center at the end of our street), dogs, or whatever strikes his fancy. If we don’t acknowledge his discovery immediately, he will continue to yell “Mama” or “Dada” until we say, “Oh, yes, Zane. That is a beekawoe (motorcycle)!” He’s definitely not a “baby” anymore, which is heartbreaking but also exciting.